It’s been 11 years since KISS entered the studio. Since then, the band has been declaring that no one wanted a new album. Singer/guitarist Paul Stanley seemed to believe that the fans would tolerate a new song played live, but ultimately they would say “that’s great. Now play Love Gun.” So it seemed odd that after years of apathy, KISS announced that they were going into the studio to record again. Whatever the reason for the change of heart, the band surprisingly delivered a disc that lives up to their past. Devoid of outside songwriters, the band locked themselves into a studio and banged out 11 tracks that combine elements of past albums; Rock and Roll Over, Love Gun, Creatures of the Night and Revenge. The album kicks off with “Modern Day Deliliah”, which sounds like an outtake from 1992’s Revenge disc. The song is perfectly ok. Not great, but a good opener. The album really picks up with bassist/singer Gene Simmons’ tracks. “Yes I Know (Nobody’s Perfect)” sounds like it could have been taken directly from 1976’s Rock And Roll Over sessions. This is what KISS sounds like. This is the classic that fan’s have been waiting for. “I’m an Animal” could have easily come from 1982’s Creatures of the Night. “Russian Roulette” and “Hot & Cold” are both solid tracks from the blood spitting demon. Of course, this being KISS, there’s a few tracks on here that would have better been served being left off. They’re what I like to call, the “Plan 9” songs: ie, so bad they’re awesome. “Danger Us” is as ridiculous as it sounds. New catman Eric Singer’s vocal debut is a weak attempt that Stanley and Simmons wrote but obviously didn’t want to claim as their own. They knew it was weak so they passed the buck. To be fair, Singer’s voice sounds great. Lead guitarist Tommy Thayer’s track “When Lightining Strikes” is a little better but still doesn’t stand up to the other tracks. Speaking of Thayer, he makes a huge impact on this album. He basically copies and pastes parts of original guitarist Ace Frehley’s signature licks and inserts them into the new songs. While it’s fun to play “name that tune” with the solos, this is part of the reason that Sonic Boom sounds so much like KISS. Thayer has it down and seems to be the spark that lit the fire under Stanley and Simmons. 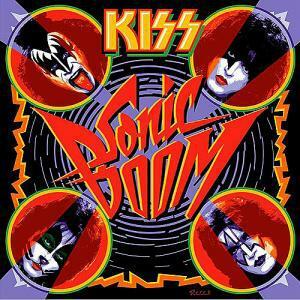 In addition, Sonic Boom comes packaged with a bonus disc of classic KISS songs rerecorded with the current line up and a 6 song DVD of a recent live show from South America. At $12, it’s worth it to venture into Walmart (where it’s exclusively available) to pick it up. Sonic Boom is the album that fans have been waiting on since 1977. This is classic KISS in every sense of the word. They take the best parts of each era of their career and roll it up into one nice mix. For a band that’s been doing this for 35 years, it’s certainly satisfying and a must own addition to any self respecting general in the KISS Army’s collection. Surprisingly, it’s also the highest charting album of the band’s career, debuting at #2 on the Billboard charts. How many bands 35 years in can say that?